It was with Mademoiselle Zambelli, in 1949, that I took my very first dancing lessons. She had private studio rue Chaptal. She would select her pupils - no more than five or six beginners a year, and no boys. We wore a white tunic in starched broderie anglaise, with pointe shoes on right from the first day – and at the time, pointe shoes were more like wooden clogs! Every exercise had to be done shod in pointes, and they were so hard, that we had to wear them around the house to try and break them! When it was that I first went up on pointe, I cannot precisely recall. 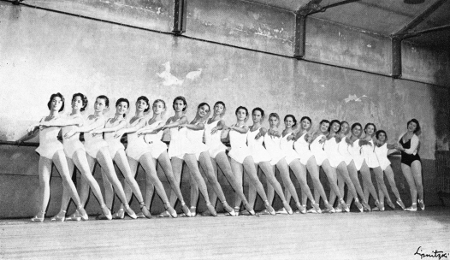 In any event, the entire first year of training was made up of barre exercises alone. Mademoiselle would give us very slow and simple exercises, unaccompanied by the pianist (she would count). I well remember the ronds de jambe à terre divided into quarters, holding four beats on each position. Many of my little comrades never went any further with their dancing than that … Sketches of the five positions were pinned to the wall. We were to have plenty of time to survey them! Steps were first learnt facing the barre, before we would attempt them in the middle. At Rue Chaptal, each of us would write our name on a little envelope and give it to Mademoiselle (she never spoke of money). Never one to waste, from time to time she would sort the envelopes, and give them back! In class, she would tear up an envelope and give each of us a little piece of paper, that we were to hold between the thumb and middle finger, in order that we learn how the fingers were to be held. These classes took place on the Tuesday, the Thursday morning and the Saturday. Once the Opera had accepted one of us, it was obvious that she had got into her good books! Mademoiselle did indeed have teacher’s pets … she liked pupils who worked hard, were graceful (as one used to say) and musical. No, she could not be described as behaving equally agreeably to all! The rue Chaptal studio had a cloakroom, Mademoiselle’s loge and a balcony, where our mothers – who fervidly watched the classes – would gather. Once we had put on our practice clothes, we would descend the stairs to the studio, where we sometimes acted very naughty before class started. One pupil would keep a look out, and the moment she would shout “She’s here!” – we would fall silent and take our place at the barre. Mademoiselle would then descend the staircase with princely dignity, and we were expected to curtsey. Class could then begin. The barre was very simple and always to the same music. But even at the barre, she would give the ports de tête, the arms, and the eyes. We were to dance! Although we were expected to smile, to be amiable, our smile, let me assure you, was not put on. Dancing was a joy to us. After the barre, we pupils were not simply to scatter wildly into the middle. Those who had been at the central barre went to the front row, those at the side barres filled the following rows, because in Mademoiselle’s eyes, everything in class was to prepare the line-up on stage. In the middle, as the first row of pupils finished an exercise, that row would part in two, each moving to one side of the room, while the row directly behind moved to the front. Great use was made of diagonals, to get us into the habit of stage-configurations. And after each exercise, we would curtsey. Mademoiselle sat in her throne-like armchair, showing us the enchaînements with her hands alone. This quickened the pupil’s intellect and imagination. Once our own class had ended, we would stay on to watch and learn from our elders. We had to catch the bird on the wing, because there was no spoon-feeding. We were to keep up. From time to time, Mademoiselle would allow one – perhaps two– youngsters to take the barre in the big girls’ class – and what a reward that was! We would be little mice behind Mademoiselle Motte or Mademoiselle Vlassi. Once we were more advanced, Mademoiselle would start off class with a preparatory movement: pliés in second with the back to the barre. The first exercise was grand rond de jambe dégagé plié seconde – typical of the day, it was performed very quickly. There was no special exercise for battements jetés, because the series of battements dégagés ended with quick battements jetés à la seconde. Battement frappé was given in the wrapped position (foot round the ankle); the foot did not brush the floor. Then came ronds de jambe en l’air, ending with a balance in retiré to the knee, then petits battements sur le cou de pied – and I do mean cou de pied and no higher! – followed by grands battements, four to the front, four to the side, four to the back. Then jambe sur la barre and pied dans la main, but no splits and no other stretches. In the middle, Mademoiselle gave a great many ports de bras, on which she placed considerable emphasis. She would often give these with troisième renversée en appuyant les épaules. Ports de bras had to be followed right through, although always passing correctly through first position. Never a broken wrist or elbow in sight! . “Allez loin” (far far away) she would say. This was her doing, and a real shift relative to the way one had danced in the early Twentieth Century, when the ports de bras had become excessively foreshortened. As for the adages, it was utterly forbidden to raise the leg above hip-level! Her adages were not especially long, but very dancey. And then Mademoiselle would give the famous séries – series of pas de bourrée, of jetés, of assemblés and so forth. Amongst the series, we would do coupés par demi-tour (coupé coupé, assemblé, temps levé), and all the various pas de bourrée avec changement de pied. Or pas de bourrée dessus dessous dessous dessus seven times in a row, then gargouillade to change foot, or pas de bourrée “bateau”, froissé (like half a flik-flak), little saut de chat; or, very quickly, pas de bourrée en diagonale en remontant, which was pas de bourrée dessus dessous dessus coupé seconde, on ONE beat. The rhythm was often one, one, then three; one one then three. We dreaded the series of assemblés in bunches of eight, en remontant en descendant, several times over! This, we were to do for the heart muscle, respiratory capacity and endurance. No less taxing were the series of entrechats trois and quatre, for which Mademoiselle insisted on the correct épaulements. Once we had got fairly advanced, the class would end – before the révérence – with variations from the repertory: Phryné or Cléopâtre (the divertissement from the opera Faust), Giselle, Halévy’s La Juive (I remember the music even now), the variation called “Le petit Chien” from Suite de danses. Mademoiselle always demanded that we act, that we express something. This is how Mademoiselle would teach pirouettes: first, three retirés de face, one tour; then one retiré, one tour, one retiré one tour, and then sixteen times tours suivis, each closing in fifth, before moving on to fouettés. To the left and to the right, always. As for tours à la seconde, Mademoiselle started off by having us perform them by quarter revolutions, with no relevé. Then a half-revolution with relevé, and we were to stay on that leg. She insisted on very quick temps de pointe (piqué) coupé fouetté. Playing with the épaulements was fundamental to Mademoiselle Zambelli’s teaching. With her, the épaulement was so pronounced as to be almost what I would dare to call a décalé d’épaule. The torso was strongly held, but always with épaulement, and the arms, and the eyes! We were learning to dance before an audience and for its benefit. From very early days, her way of working prepared us for life on stage. Mademoiselle Zambelli’s teaching was scientific. She had thought through how our technique was to progress from day one. There was a real thought-process there, a pedagogical edifice. Whenever she gave a new exercise, she knew that we were well able to deal with it. Elegant, distinguished, Mademoiselle almost always wore pearl grey. She never touched us in class. Mademoiselle was very pious. Once a month, we would meet up with her at Sunday Mass at Saint Roch, Mass being preceded by a conference on the ballet given by Mademoiselle Madeleine Lafon, for the sole benefit of the petits rats. Mademoiselle Zambelli was rather high-strung, and always wore a silk scarf round her throat that she would twist and turn in her hands when in a bad mood: “I INSIST on its being that way (Jé veux que ce soit ainsi)” she would say with her Italian accent. We were not to be ill. One day, when I was feeling iffy, she said “if you’re ill, you are to stay home”. However strict and distant Mademoiselle Zambelli may have been, she inspired boundless admiration and respect. She instilled in us a desire to dance, a bent for hard work, and above all, musicality. We all had beautiful arms, swift action in the bas de jambe and a real sense of artistry. I have ever sought to perpetrate her teaching, and had the studio in the Conservatoire du XIVème arrondissement where I taught for forty years named Studio Zambelli. I cannot say how much I owe to her. Born in 1941, Michèle Auvergne-Tharaud entered the Opera school in 1952. After graduating, she joined the ballet of the Théâtre du Châtelet in 1957, then headed by Maurice Lehmann (1895-1974), and danced there for five years before touring throughout France. On retiring from the stage, she began a forty-year teaching career at the Conservatoire of the 14th arr. She also taught at the Conservatoire Marius Petipa in the Ninth arr. (formerly the Studio Wacker) throughout its twenty-one year existence. She has choreographed the divertissements in many operettas for Michel Dens’ Association lyrique and for the Association lyrique d’Ile de France. Michèle Auvergne-Tharaud holds the Médaille d’Or du Mérite et Dévouement and is Chevalier de l’Ordre des Arts et des Lettres.